Historic Jean Bonnet Tavern, is not only popular for their delectable menu and beautiful rustic charm, it's the documented ghost hauntings that draws visitors from all over the world. 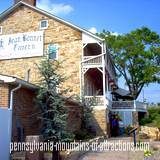 This famous Haunted Pennsylvania attraction is located in Bedford, PA,. Built in early 1700s, the area was once a trade route for Shawnee Indians. Records indicate that this same area was then under control of the French. It is documented that the building known now as Jean Bonnet Tavern was once a French Fort. 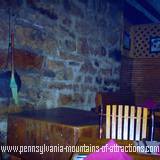 Through years of research the Pennsylvania ghost hauntings at Historic Jean Bonnet Tavern is historic in nature and have been proven true! Known for his prankish nature, the spirit of a man hung in the tavern, back in the 1700s, has been seen many times sitting at the bar, and again in the same area he was hung. The man was suspected of being a French Spy. At that time France was considered the enemy by the British Army. His body was buried under the floor so the French wouldn't find him. In the 1950s Historic Jean Bonnet Tavern was taken over by a new owner who decided to replace the the floor boards in the old tavern. A skeleton of a man was found. Later the skeleton was tested and proven to date back to the 1700s. The English used the Tavern as a court house once a month. During one of their court sessions a horse thief was chased into the building by Shawnee Indians. In those days a horse thief was considered one of the worst crimes. While deciding what to do with the man, the Shawnee tribe surrounded the small fort and threatened to attack. The English quickly gave the man a trial and hung him in the hallway. They gave the body to the Shawnee Indians to prove justice was taken care of. You can visit Shawnee State Park, named after the Shawnee Indians since they used this PA State Park as a refuge in the 1700s. Since then many witnesses have seen several ghost hauntings in this area. Recently, a small child became so frightened by what he saw in the hallway, he had to be carried out of the Jean Bonnet Tavern by his parents, but they had to find another route. 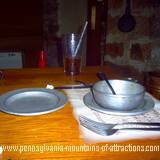 There have been many eye witnesses to seeing a group of old fashioned looking people, dressed like prospectors, watching the different shows and holiday attractions offered at Jean Bonnet Tavern. Several employees and guests have reported hearing a piano playing, or a noisy party going on, only to find there is no one sitting at the old piano or anyone having a party. Many times the witness was alone in the tavern. Visitors have complained of someone touching them when there was nobody nearby. 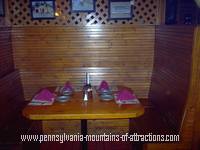 Many recent visitors and employees have seen forks fly off the tables for no apparent reason. Visitors have taken pictures around the Jean Bonnet Tavern and have seen spirit-like figures sitting at the tables and bar area. The first floor of Jean Bonnet Tavern is a beautiful restaurant, well known for its exceptional menu and tasty meals. The second floor is the bar area. A well known fixture there is its antique spinning wheel. It sets away from the area of the visitors. It's common to be sitting at the bar with nobody near the spinning wheel and it will slowly start spinning. Several times over the years I have heard tales of a ghost haunting by a man dressed in olden-day clothing, along with wearing a Quaker hat. What is strange is the reports say that the ghosts legs are missing from the knees down. It is said that after the new owners installed a false floor in the tavern, (that is when you put new flooring over the top of the old flooring). Apparently this Pennsylvania ghost doesn't realize he's still walking on the old flooring. Any visitors that has seen him swear he looks like he is walking on his knees. Bedford, PA is a beautiful historic area to spend a day or family weekend get-away. Known for their wonderful antique shops and unique buildings. Take a walking tour in downtown Bedford and you'll be walking along the same path as historic figures like George Washington, and Mad Anthony Wayne. Another interesting Haunted Pennsylvania Attraction that is only a few miles from Historic Jean Bonnet Tavern is the Historic Hotel Lincoln , known as "The Best Little Historic Bordello in Pennsylvania". It is now an antique shop. You can also enjoy attractions like Old Bedford Village, and the Fort Bedford Museum. Within a few miles from Bedford is the site of Flight 93 crash site. Visit PA Memorials to read the story behind the Flight 93 Memorial and directions to what is now called "The Field of Honor". 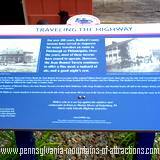 Check out PA State Parks and read about Shawnee State Park , named after the Shawnee Indians that threatened to attack Historic Jean Bonnet Tavern in the 1700s. There are so many Historic Haunted Pennsylvania attractions in Bedford that the Bedford tourism offers a walking lantern tour. Guiding visitors through the haunted areas and telling the unique stories associated with the many attractions.